In retrospect, President Trump had a fair amount in common with the tea party movement — we sometimes placed him there in the chart, and sometimes put him outside of the five circles entirely. But he was really running as more of a mix of a tea party populist on issues such as immigration1 and a Northeastern moderate on economic policy. (In Pennsylvania, for instance, Trump did just as well with self-described moderate voters as with conservatives.) 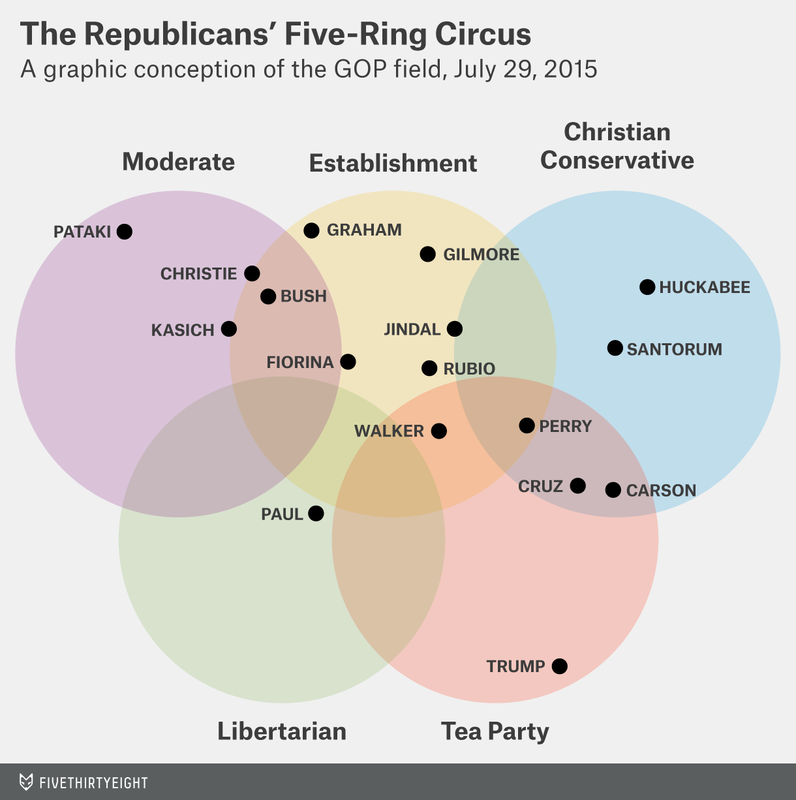 Problematically, our five-ring circus chart didn’t even consider the possibility of candidate who overlapped between the moderate wing and the tea party wings of the GOP. Trump also won over a significant number of evangelical voters, even though he had not exactly abided by a “family values” lifestyle, nor did he make a particular priority of issues such as abortion. So rather than thinking about “lanes,” we’re taking a more pluralistic approach with the Democrats. 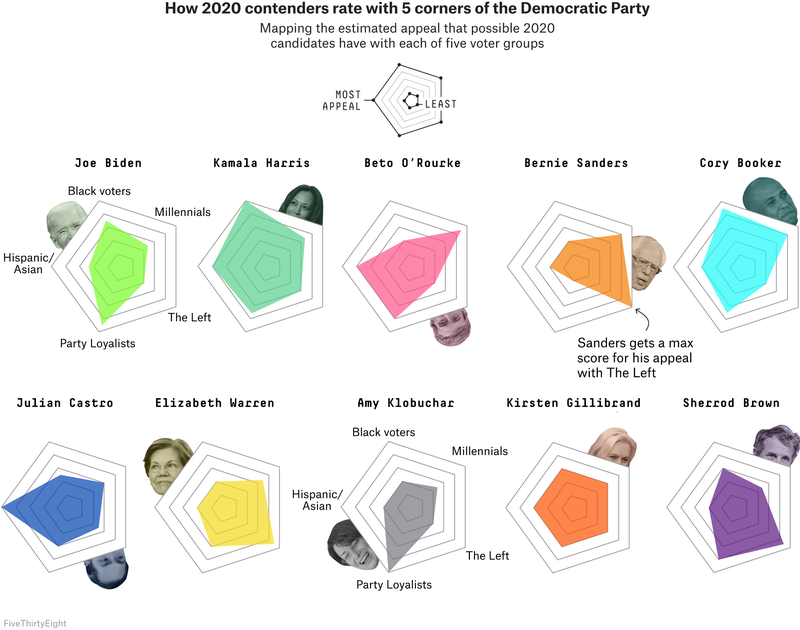 Candidates don’t have to pick any one group; rather, their goal is to build a majority coalition from voters in (at least) three out of the five groups. There are a lot of ways to do this: If you’re choosing any three from among the five groups, there are 10 possible combinations to pick from,2 and all of them plausibly form winning coalitions. In 2016, for example, Hillary Clinton assembled a coalition of Party Loyalists, black voters and Hispanic voters, largely ceding the other two groups to Bernie Sanders, but still winning the nomination with room to spare. One obvious question you might have before we proceed further: Why aren’t women one of the groups? The answer is that women represent almost 60 percent of the Democratic primary electorate3 and so they’re a major portion of all of these groups. In fact, women are likely the majority of all of these groups, with the possible exception of The Left, which skews male. So when you think of a default voter from one of these groups, you should probably think of a woman. Demographic profile: Mostly older, white and upper-middle class. And mostly women. Many are politically active and count themselves as members of the #Resistance. As a rough guide, Party Loyalists probably represent around 30 percent of the Democratic electorate; in the Illinois Democratic primary in 2016, for example,4 about 30 percent of voters selected “experience” or “electability” as their top candidate quality and voted for Clinton rather than Sanders. Ideological preferences: On average, millenials care about racial justice, access to education and environmental issues more than older Democratic voters do. Younger voters view socialism much more favorably than older ones do, but the story is more complicated than millennials simply being further to the left: Younger voters5 also have more favorable views of libertarianism than older ones do, for example. Put another way, millenials are less wedded to the dominant political philosophies and labels of the previous generation and are willing to consider a fairly wide range of alternatives to replace them.